Henrik Fisker, a former Aston Martin design director and co-founder of the failed maker of electronic cars that bore his name, unveiled the prototype Thunderbolt at an auto show in Florida this month. LOS ANGELES (Bloomberg) -- Aston Martin said Henrik Fisker’s “Thunderbolt” prototype for a $400,000 GT coupe is an unauthorized copy of its iconic sports cars featured in James Bond movies for 50 years. Fisker, a former Aston Martin design director and co-founder of the failed maker of electronic cars that bore his name, unveiled the prototype at an auto show in Florida this month. The V12 coupe is only available by special order through a Los Angeles-based Aston Martin dealer. The prototype features minor variations of Aston Martin’s trademarked design features, including the wings logo and side vents, the British carmaker said in a complaint filed Thursday in Los Angeles federal court. Fisker’s purported plan to sell a production version that doesn’t include some of those features is a classic “bait-and-switch” scheme, Aston Martin said. “Fisker’s bad-faith intent to free-ride off the tremendous goodwill associated with the famous Aston Martin mark, wings logo, side vent mark, and Vanquish mark could not be more transparent,” Aston Martin said. 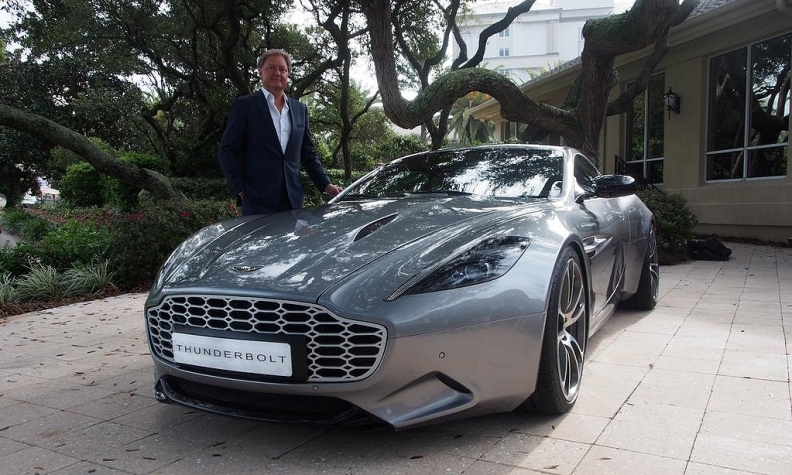 Aston Martin alleges Fisker used an earlier-generation DB9, or DBS, model as “donor” for the Thunderbolt and only claims it was based on the Vanquish to link it to Aston Martin’s newer, high-end model by that name. Representatives of Galpin Aston Martin, where the Thunderbolt can be ordered, didn’t immediately respond to a phone call seeking comment on the lawsuit. A call to HF Design, Fisker’s design company, wasn’t immediately returned.